1. In the top of a double boiler, combine the egg yolks, sugar and Marsala and whisk quickly to combine. 2. Add water to the bottom part of the double boiler and bring to a boil. When water begins to boil, reduce to a simmer and place the top part of the double boiler over it, making sure that the bottom does not come into contact with the simmering water and that the water remains at a high simmer and does not boil. 3. Using an electric mixer, beat the mixture until it is doubled or tripled in volume. This could take up to 10 minutes. 4. When the mixture is frothy, plunge the top of the double boiler into a bowl of iced water and continue beating until cool, then set aside. 5. Slowly add the whipped cream to the mixture and refrigerate the Zabaglione. 6. 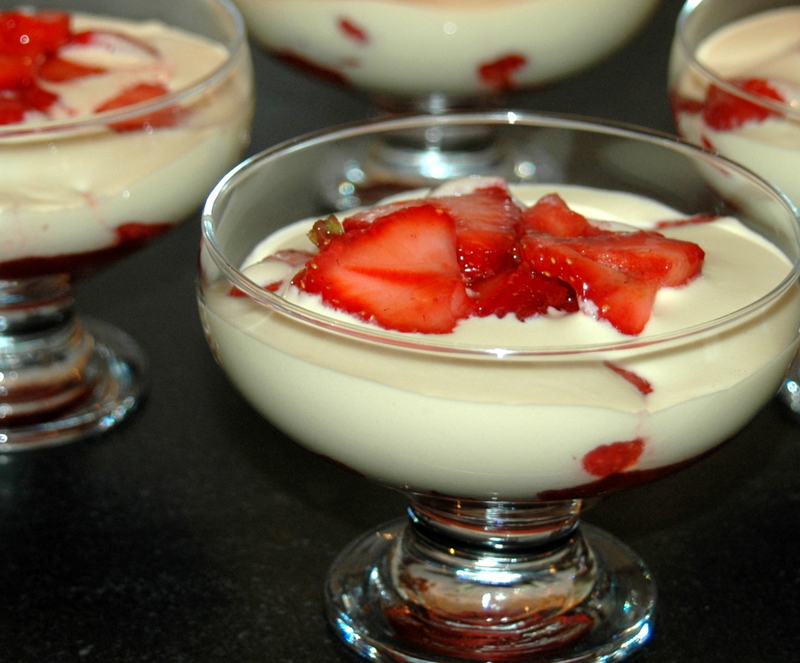 Remove the Zabaglione from the refrigerator 20 minutes before serving. 7. To serve, place the strawberries in a glass dessert dish, balloon wine glass or other festive and suitable serving dish and spoon the Zabaglione over the strawberries. Note: Consider adding a finely minced jalapeño pepper to the marinade for an added zing. 1. Combine the first six ingredients in a mixing bowl and whisk to blend well. 2. Place the striped bass in shallow, non-reactive pan and pour the marinade over it. 3. Marinate at room temperature for 1 hour, turn the fillet after 30 minutes. 4. Oil the grate on a gas grill and preheat on medium-high. 5. Grill the fish with cover closed for 8 minutes on the first side, basting once with the marinade. 6. Turn the fish and repeat for an additional 6 minutes. 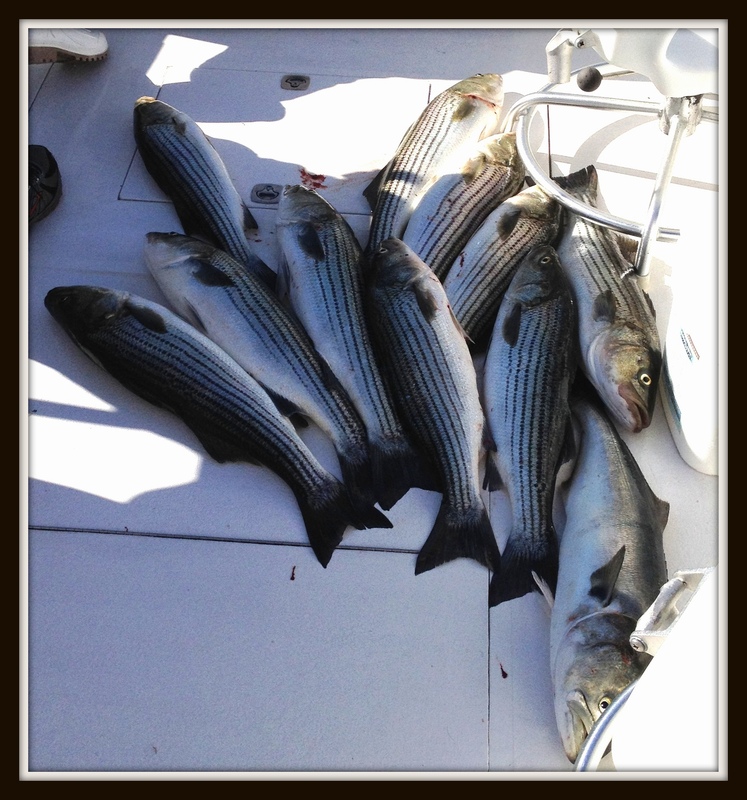 Our son-in-law went fishing out of Barnstable Harbor last Friday aboard the Lucky Lady, and, as our luck would have it, he and his friends reeled in a multitude of Stripers. He was kind enough to bring us 2 large cleaned fillets, so dinner for Father’s Day was a foregone conclusion. • Enough extra virgin olive oil to blend it into a paste, which I then browned in a small sauce pan. For the Mexican method, I reached back 20 months ago to a trip to Baja California and fishing with several friends in the Pacific, off of Cabo San Lucas, aboard the Bob-Marlin. On that occasion we caught Wahoo and Dorado (also known as Mahi-Mahi), which we then brought to a local restaurant that prepared them in several different styles. My favorite preparation was grilled over an open fire after marinating in a lime/cilantro combination. I decided to try and replicate that and added some minced ginger for a little kick. It was superb, but next time, perhaps, I will add a little minced jalapeño as well. For the recipe see Grilled Striped Bass in Lime Marinade. Strawberries are in season and thanks to my friend Frank from the Finger Lakes, who sent me an article from his local newspaper on Mario Batali‘s recipe for Zabaglione, our Father’s day dinner was concluded with a spectacular dessert, Strawberries with Zabaglione. Update form October, with a new picture. 1. Rinse and drain the blueberries, raspberries and blackberries, place them in a mixing bowl. 2. Hull the strawberries, rinse and drain them, slice them widthwise and add to the mixing bowl. 3. Add the sugar and mix well. 4. Add the Marsala and mix well. 5. Cover the bowl with plastic wrap and let the berries macerate at room temperature for several hours prior to serving. 6. Serve with heavy cream as desired. Please see: Sunday Chicken Dinner – No Leftovers! 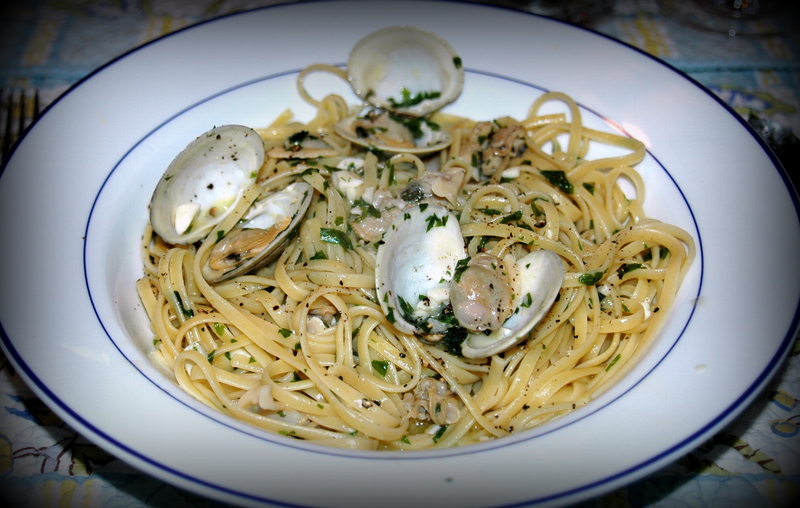 Summer is fast approaching and it is time to make one of our favorite pasta meals, Linguine with White Clam Sauce. 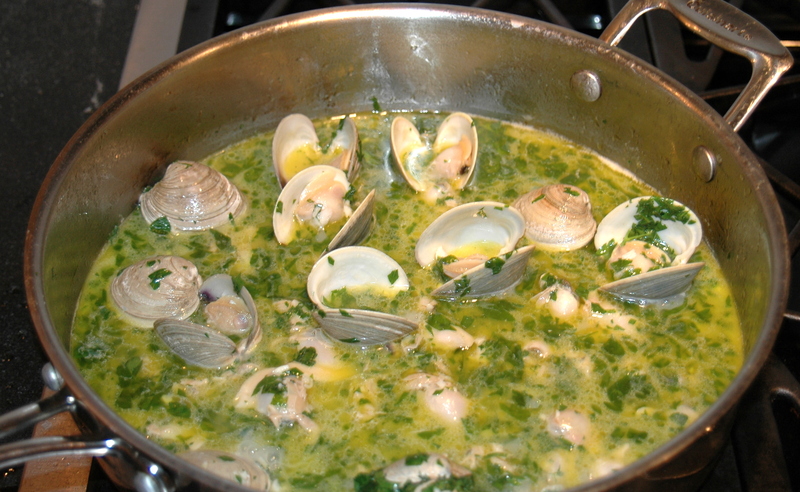 This is a quick and easy meal to prepare, with most of the work centered on opening the clams. Fortunately, Big Mike’s best friend, my ‘Uncle’ Joe, was a master clam shucker and taught me the technique, at the many clambake/cookouts he hosted in his Long island backyard in the 1950s. Uncle Joe moved with his family from the Bronx to Long Island in the early 50s as the potato farms in Nassau County were being sold to real estate developers and constructing tract housing for the returning WWII GIs was a booming business. We still lived in Inwood, without a car. But at least once a month, Uncle Joe drove all the way in from Franklin Square on a Saturday morning to pick up our family, drive us out to his house, and return us to our one-bedroom apartment on Sunday night. Besides learning how to shuck clams and eat them on the half-shell, Uncle Joe taught me how to pour a beer, build a charcoal fire and grill sausages, skills that have served me well in life. He loved life and lived it to the fullest. I wish our daughters could have known him, but he died much too young. Those weekend outings to ‘the country’ were a real treat, and I remember them and Uncle Joe’s generosity with great fondness. Dorothea, who did not learn how to shuck clams, taught me how to make a clam sauce the easy way: sauté some chopped garlic in olive oil, toss in some chopped fresh parsley, add a bottle of clam juice and a can of minced clams and voila, homemade clam sauce. It was darn good as far as I was concerned and I didn’t know any better, so that recipe sufficed until I began to experiment on my own. At first, I merely substituted fresh clams for the canned ones, a significant improvement. Then later, after comparing notes with Tommy T, he convinced me to add butter to the olive oil to finish the sauce. Finally, after reading a few cookbooks, I decided that a little bit of dry white wine would round it out perfectly. So here it is, Chef Scar’s own Linguine with White Clam Sauce. And, if like me, you enjoy cheese with your pasta, don’t listen to the so-called purists who will admonish you for adding cheese to seafood, go ahead and liberally heap several tablespoons of grated Pecorino-Romano, preferably Locatelli brand on your Linguine. Mangia! The secret to opening clams is to get them ice cold so that they relax, and use a good thin-bladed clam knife, don’t try to use a kitchen knife or an oyster knife.